Bang, bang, tinkle, tinkle ... Who can skillfully knock the ball through the holes and/or elicit great sounds from the pentatonic-tuned metallophone? Two activities, both of which are just a lot of fun. 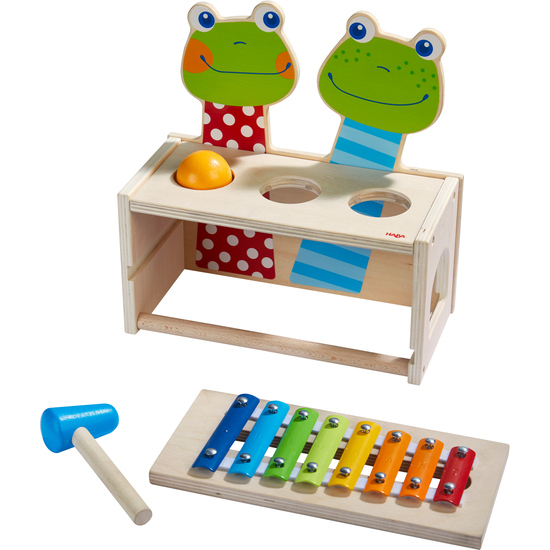 And as a bonus, the game helps to develop fine motor skills and musical understanding. Contents: 1 hammer bench, 1 metallophone, 1 wooden mallet, 1 ball.